Some women have a weakness for shoes whilst others are self-confessed chocoholics. I have a bit of a problem with biscuits (for my American readers read that as cookies!). They call to me from the kitchen! It has got so bad that I can’t even have them in the house because I know that I will eat them. I openly admit that I am a culinary snob when it comes to cakes. I just don’t see the point in buying ready-made cakes or even worse a cake mix! Not when you can make them so easily! But when it comes to biscuits, I couldn’t care less. I just love them! When I was little, I guess about 5 or 6; Mum and I lived in a top floor flat in my home town of Worcester. Yes, where the sauce is made and Royal Worcester Porcelain. Mum was training to be a nurse and often worked nights so slept during the day. I remember walking home from school on my own, opening the door with a key that hung on a string behind the letter box and having to wake my Mum up just as the Blue Peter theme tune started on our old black and white portable television. You can tell how young I was because I still couldn’t tell the time! Can you imagine kids of 5 or 6 today being allowed to do the same thing? But hey, that was the 70s! Mum always put in the fridge for me a glass of milk and plate with a sandwich and two biscuits. I blame my Mum for my biscuit addiction because all the way home I would be thinking, “Will it be a Bourbon biscuit? Or a custard cream? May be it had been payday and we had chocolate digestives or even Jaffa Cakes!” And for all of those of you out there that think Jaffa cakes are cakes – they are biscuits! Alright! Anyway, I looked forward to finding out what was waiting for me all the way home. It was only when I went to Grammar school that my love of biscuits became a problem. Back in those days young ladies were taught home economics lessons and needlework alongside their English and Maths and of course, Latin. Yes, I can amo, amas, amat with the best of them! Run up a curtain or two on the sewing machine? Not a problem! It was home economics (cookery) that was my undoing, however, because that was where I learnt how easy it is to bake biscuits! One of the first things we were ever taught to cook was shortbread. It is so simple! 3 ingredients rubbed together and shoved in the oven. And Bob’s your uncle, you have shortbread! 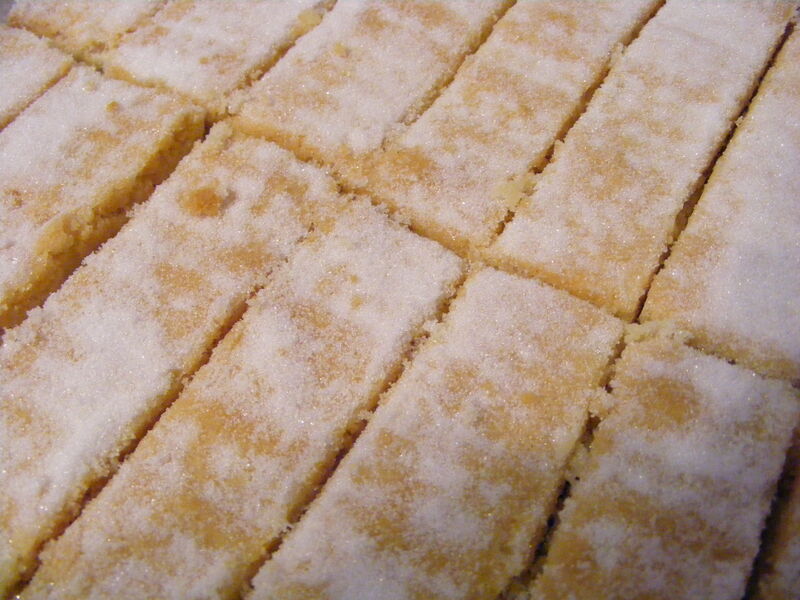 I can still remember the teacher drilling into us that perfect shortbread required a 2:4:6 ratio! Here is my version of that very traditional English recipe. Score the dough into 16 pieces and mark all over with a fork. Bake in the oven for 30-35 min or until pale golden brown. Dredge with extra caster sugar whilst the biscuits are still warm then allow to cool completely. They look great! I always though of shortbread as traditionally Scottish. They probably are but I’m English so thought it was a bit of a liberty to call them Scottish Shortbread! Having said that I think you will find them in any self-respecting tea shop the length and breadth of the UK. Either way, they are dangerously nice! 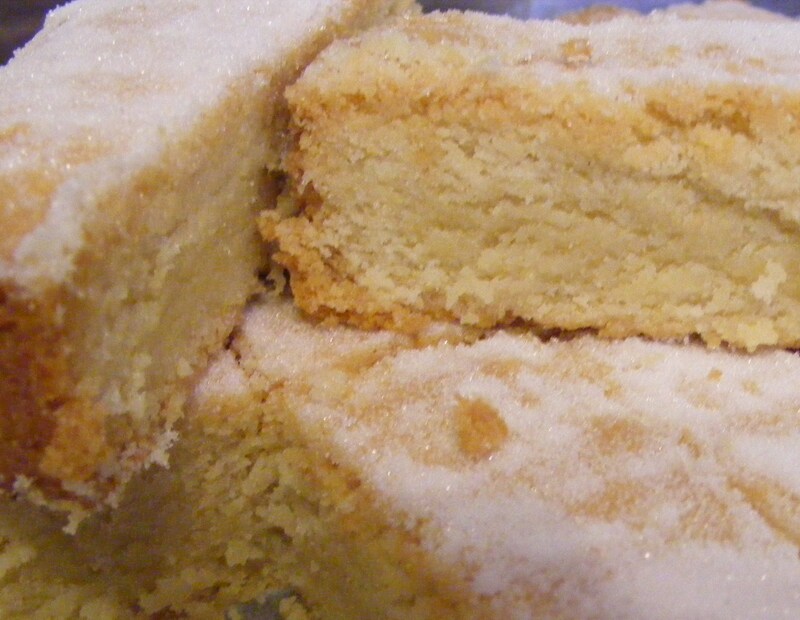 This is the best shortbread recipe I have ever made. Thank you so much for sharing! I added it to my blog at kookiecookers.com and linked back to your site. Please let me know if you disapprove of it and I will take it down. Thanks again.